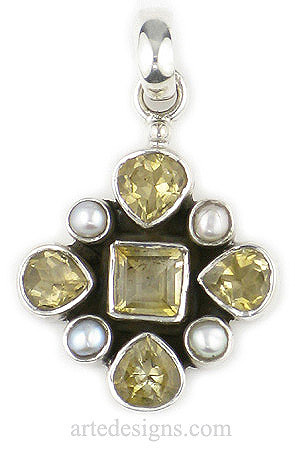 Scintillating citrine gemstones pair up with petite pearls to create this sparkling gemstone pendant. Citrine is said to enhance creativity and bolster one's self-confidence. It is also helpful in assisting one to acquire and maintain wealth. It is the symbol of hope. Approximately 1 inch. Sterling silver setting.